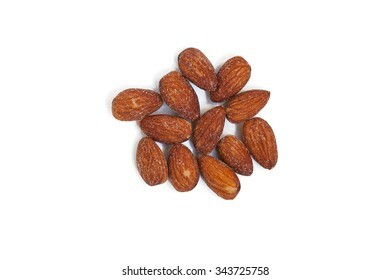 806 stock photos, vectors, and illustrations are available royalty-free. NAGANO,JAPAN-APRIL 8,2016:E7 Series bullet (High-speed or Shinkansen) train.This train operated by JR East and JR West,services as Kagayaki(Shine) for Hokuriku Shinkansen line(Tokyo - Kanazawa route). 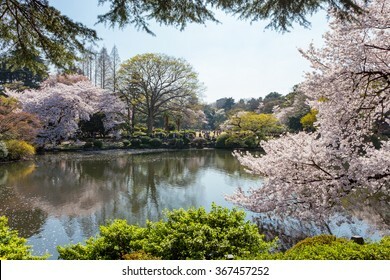 The pond and Cherry-blossom trees in Shinjuku Gyoen national garden. 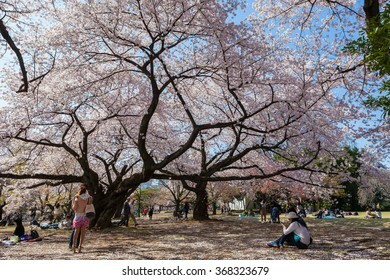 This park is a very famous and popular Cherry-blossom(Sakura) viewing spot in Tokyo. 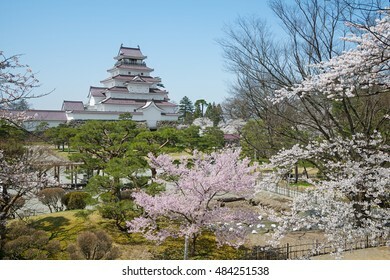 The cherry-blossom trees in Tsuruga castle park (Aizuwakamatsu castle park), Fukushima, Japan. 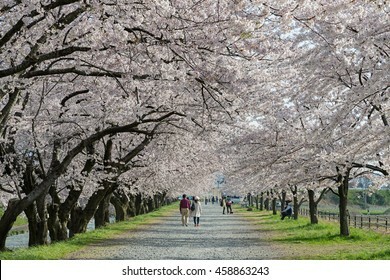 This park is selected in Japan's Top 100 Cherry-blossom spots by the Japan Cherry-blossom Association. 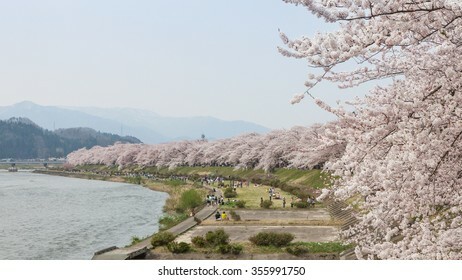 TOYAMA,JAPAN - APRIL 9,2016 : The Cherry-blossom (Sakura) trees along the bank of Funakawa river in the town of Asahi. 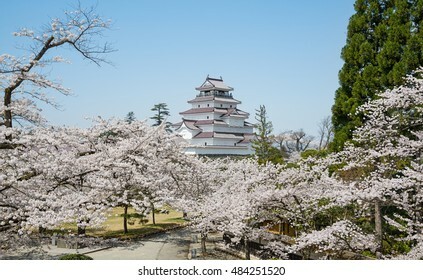 This place is a very popular Cherry-blossom (Sakura) viewing spot in Toyama. TOKYO-April 15,2016:Side view of the green E5 Series bullet(High-speed) train. 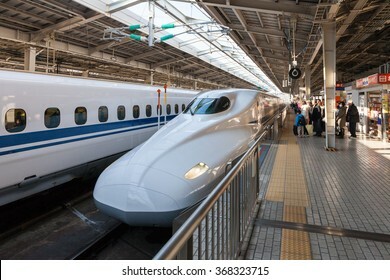 It services as "Hayabusa(Falcon) or Hayate" operated by JR East and JR Hokkaido for Tohoku and Hokkaido Shinkansen lines. 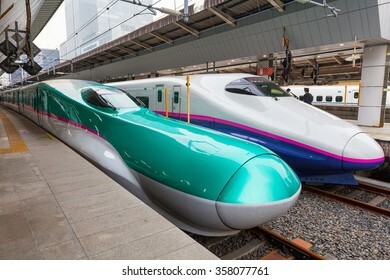 IWATE,JAPAN-April 19,2016:The green E5 Series bullet(High-speed) trains in Morioka station.It service as "Hayabusa(Falcon) or Hayate" operated by JR East/Hokkaido for Tohoku/Hokkaido Shinkansen lines. Full bloom Cherry-blossom trees at Ueda park entrance. 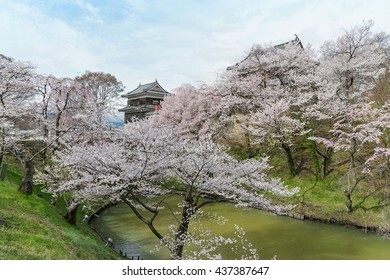 Ueda park is a very famous and popular Cherry-blossom (Sakura) viewing spot in Nagano prefecture, Japan. 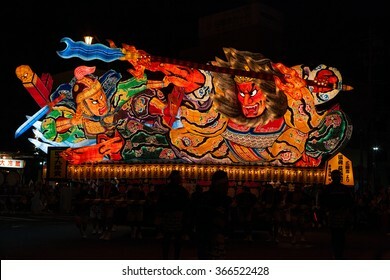 AOMORI, JAPAN - AUGUST 5: Illuminated Nebuta float parade through the night in Aomori Nebuta Matsuri on August 5,2015 in Aomori.Nebuta Matsuri is a summer festival, held every year from August 2 to 7. 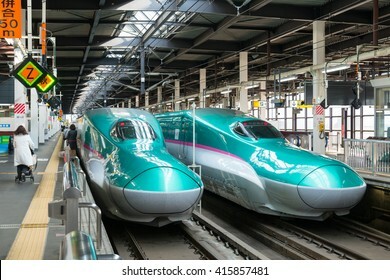 TOKYO - APRIL 1 : Green E5 series and white E2 series bullet trains on April 1 , 2015 in Tokyo.They service as super express (or high-speed train) for Tohoku Shinkansen (Tokyo - Shin Aomori route). HOKKAIDO,JAPAN-APRIL 19,2016: H5 Series bullet(High-speed,Shinkansen) train at Shin-Hakodate-Hokuto station. This train is brand new train, enter service in March 26,2016 for Hokkaido Shinkansen line. 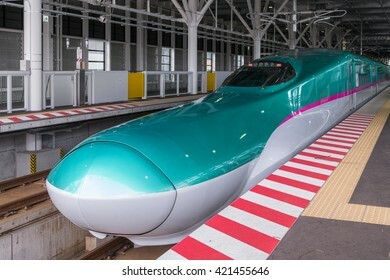 IWATE,JAPAN-April 19,2016:The green E5 Series bullet(High-speed) train in Morioka station.It services as "Hayabusa(Falcon) or Hayate" operated by JR East/Hokkaido for Tohoku/Hokkaido Shinkansen lines. 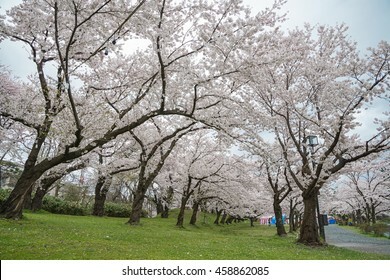 The full bloom Cherry-blossom trees in Tsuruoka park,Yamagata prefecture, Japan. 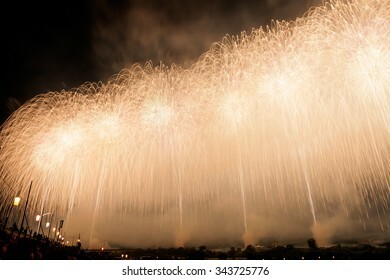 Tsuruoka park is included in the best 100 selection of cherry blossoms (Sakura) of Japan. 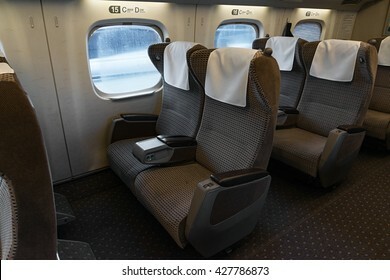 NAGANO , JAPAN - APRIL 8,2016 : Green seats of E7 Series bullet (High-speed or Shinkansen) train. 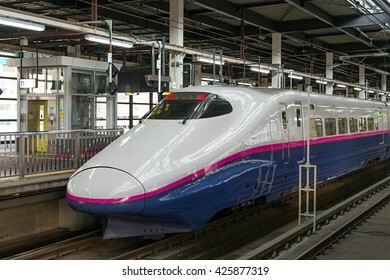 This train services as "Kagayaki(Shine)" for Hokuriku Shinkansen line (Tokyo - Kanazawa route). TOKYO-April 19,2016: Green seats of E5 Series bullet(High-speed,Shinkansen) train. 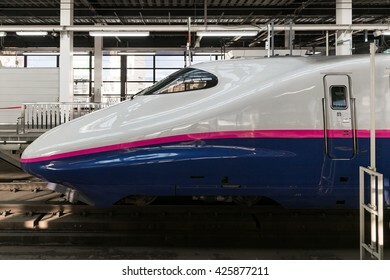 This Shinkansen train service as "Hayabusa or Hayate" operated by JR East/Hokkaido for Tohoku/Hokkaido Shinkansen. 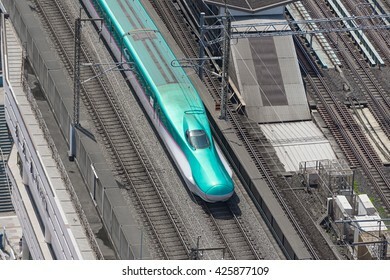 TOKYO - APRIL 10: The green E5 Series bullet (High-speed) trains on April 10, 2013 in Tokyo. 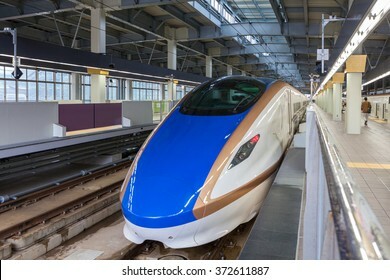 It service as "Hayabusa(Falcon)" operated by JR East for Tohoku Shinkansen line (Tokyo- Shin Aomori route). 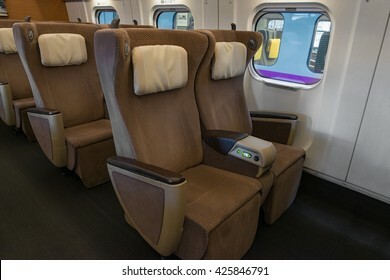 ISHIKAWA , JAPAN - APRIL 6 : Gran class seats of E7 Series bullet train on April 6 , 2015 in Ishikawa, Japan. 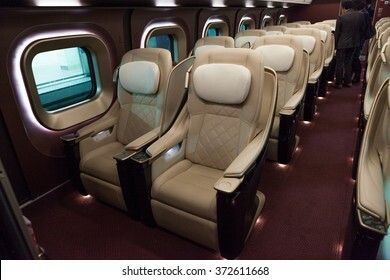 Gran class is the most luxury seat class in Japanese train. 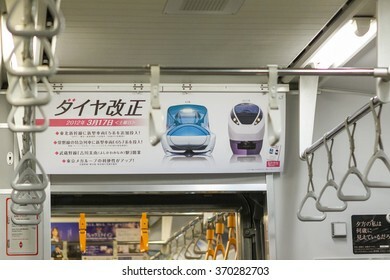 TOKYO - MARCH 15: The hanging advertising banner in tokyo metro train on March 15 , 2012 in Tokyo. This banner presents East Japan railway company new train. 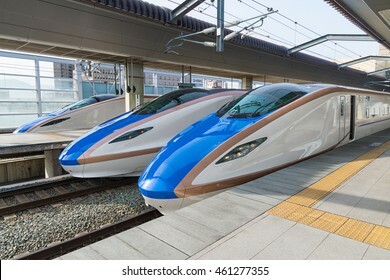 NAGANO,JAPAN-APRIL 9,2016: E7 Series bullet (High-speed or Shinkansen) trains.This train services as Kagayaki(Shine) for Hokuriku Shinkansen line(Tokyo - Kanazawa route). Kakunodate city,Akita,Japan - April 27,2014 : Cherry blossoms or Sakura in Hinokinai riverside. TOKYO-April 14,2016:Side view of the green E5 Series bullet(High-speed) train. 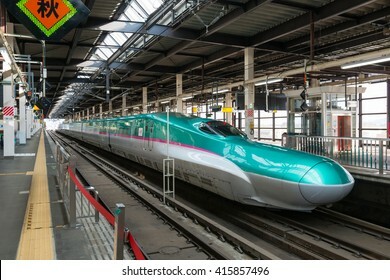 It services as "Hayabusa(Falcon) or Hayate" operated by JR East and JR Hokkaido for Tohoku and Hokkaido Shinkansen lines. 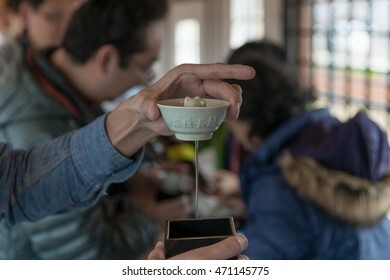 TOKYO - APRIL 1: Visitors ride the swan boat on the Inokashira pond on April 1 , 2015 in Tokyo. 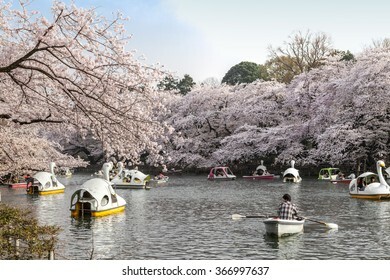 Inokashira park is a very famous and popular Cherry-blossom(Sakura) viewing spot in Tokyo. 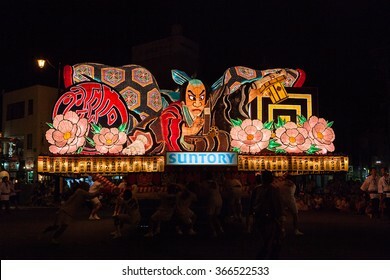 AOMORI,JAPAN - AUGUST 5:Illuminated Nebuta float parade through the night on August 5 , 2015 in Aomori, Japan. 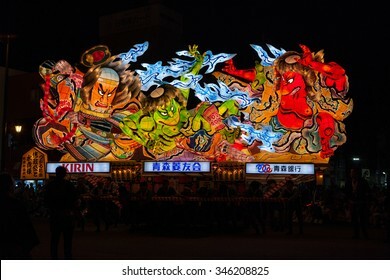 Aomori Nebuta Matsuri is the Japanese summer festival,held every year from August 2 to 7. TOKYO - APRIL 2: Visitors in Shinjuku Gyoen national garden on April 2 , 2015 in Tokyo. 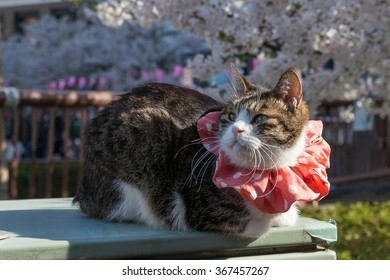 This park is a very famous and popular Cherry-blossom(Sakura) viewing spot in Tokyo. Cherry-blossom (or Sakura) trees at Meguro riverside. 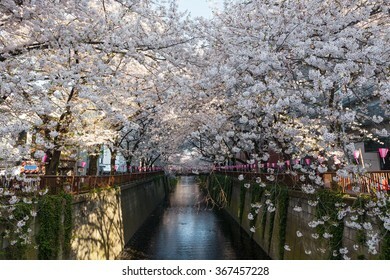 Meguro river is a very famous and popular Cherry-blossom viewing spot in Tokyo. 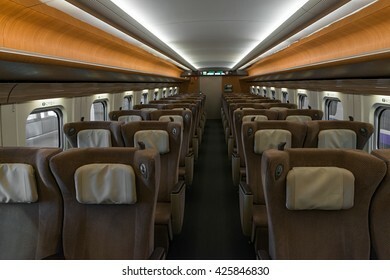 ISHIKAWA , JAPAN - APRIL 6 : Green seats of E7 Series bullet train on April 6 , 2015 in Ishikawa, Japan. 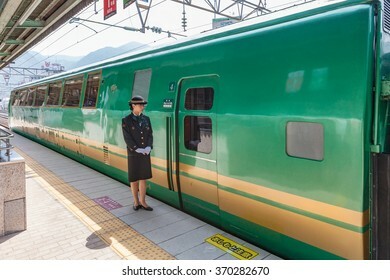 This train service as "Kagayaki(Shine)" for Hokuriku Shinkansen line (Tokyo - Kanazawa route). 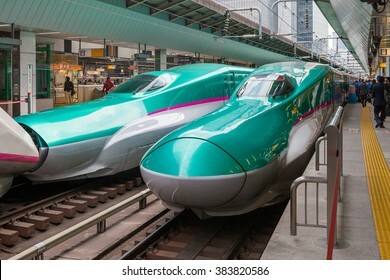 HOKKAIDO,JAPAN-APRIL 19,2016: The green E5 Series bullet(High-speed) trains in Shin-Hakodate-Hokuto station.It service as "Hayabusa(Falcon) or Hayate" for Tohoku/Hokkaido Shinkansen lines. 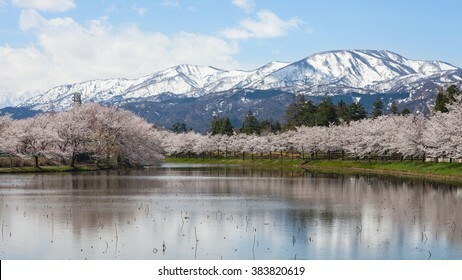 Mountain Iwate in spring. 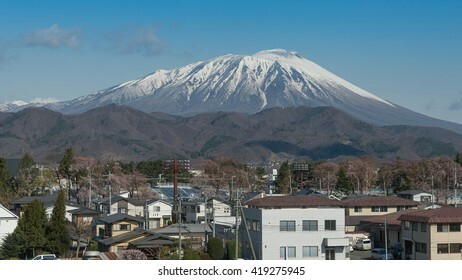 Mountain Iwate (2,038 metes) is the highest mountain in Iwate prefecture and is one of Japan's 100 most beautiful mountains. 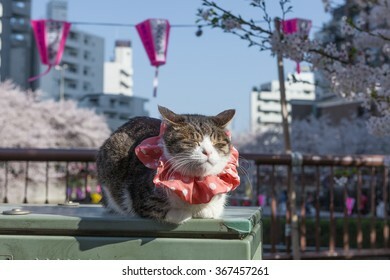 The cat at Meguro riverside. 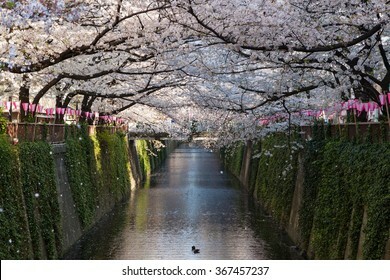 Meguro river is a very famous and popular Cherry-blossom viewing spot in Tokyo. 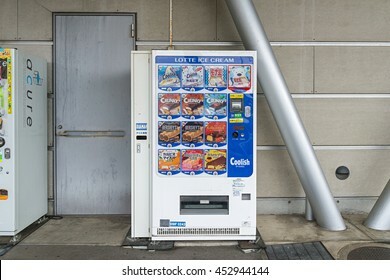 YAMAGATA , JAPAN - APRIL 14,2016 : The ice cream vending machines at Akayu station platform. 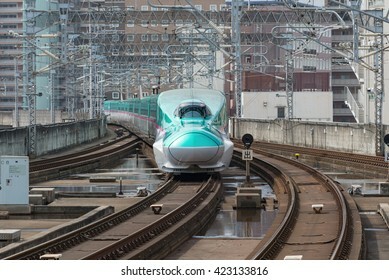 TOKYO - FEB 5: the N700A Series bullet train at Tokyo station on Feb 5 , 2013 in Tokyo. N700A Series service as "Nozomi (Hope)" for Tokaido Shinkansen line (Tokyo - Hakata route). 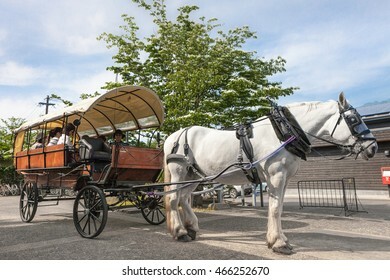 OITA,JAPAN - MAY 29,2014 : A horse-driven carriage for tourist in front of Yufuin station. 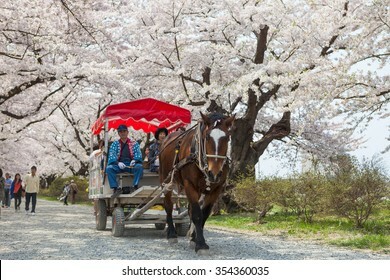 A horse-driven carriage has been running since 1975 ,Now it is an iconic attraction of Yufuin city. 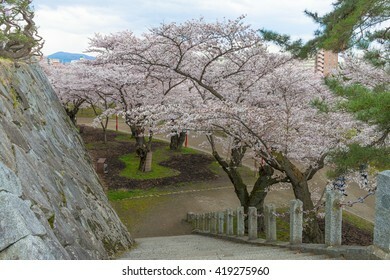 Cherry-blossom (Sakura) trees and many kinds of flowers in Hanamiyama (Mountain of flowers) park with Fukushima cityscape, Japan. 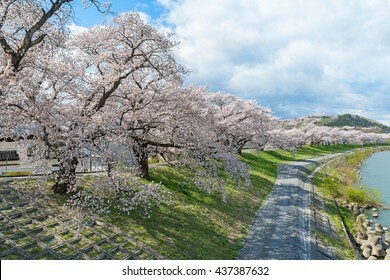 This park is a very famous Sakura viewing spot in Tohoku region. 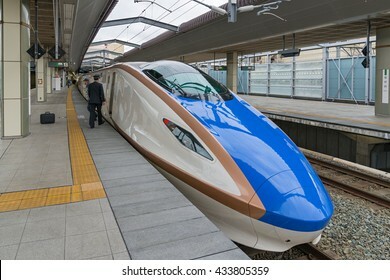 ISHIKAWA , JAPAN - APRIL 6 : The E7 Series bullet train on April 6 , 2015 in Ishikawa, Japan. 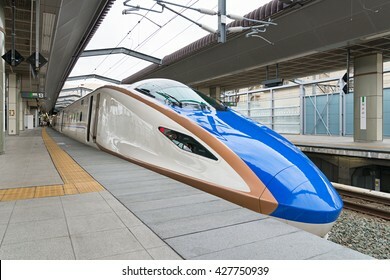 E7 Series bullet train service as "Kagayaki(Shine)" for Hokuriku Shinkansen line (Tokyo - Kanazawa route). 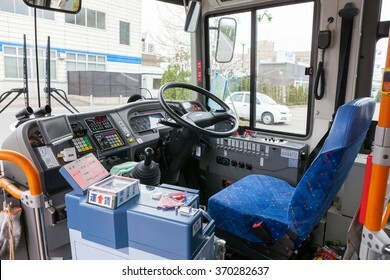 FUKUI,JAPAN - APRIL 6: The bus driver seat on April 6, 2013 in Fukui, Japan. 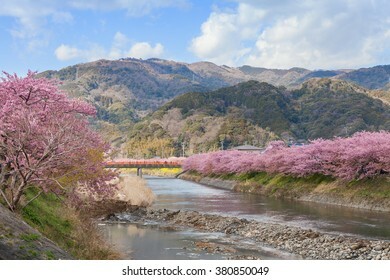 The Kawazu-zakura cherry blossoms, the most famous early flowering variety of cherry blossoms, at Kawazu riverside, Shizuoka, Japan. 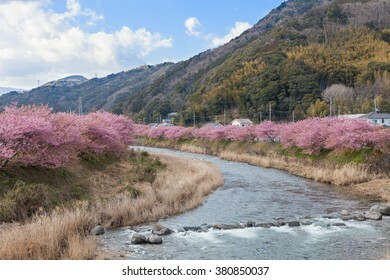 This place is the most famous Kawazu-zakura viewing spot in Japan. 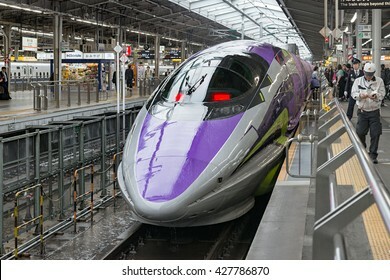 OSAKA,JAPAN-APRIL 7,2016:500 TYPE EVA, the spaceship-themed Shinkansen. 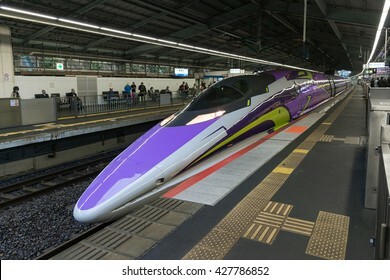 This is special Shinkansen train to celebrate 40th anniversary of Sanyo Shinkansen and 20th anniversary of Evangelion TV series. FUKUSHIMA, JAPAN - MARCH 15: The local train at Aizu-Miyashita station on March 15 , 2014 in Fukushima , Japan. 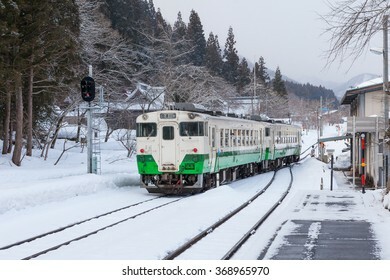 This train services in East Japan railway company's Tadami line. 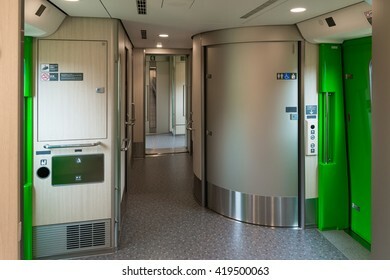 HOKKAIDO,JAPAN - APRIL 19,2016 : Wheelchair accessible toilets and Multi-purpose space in H5 Series bullet(High-speed) train. 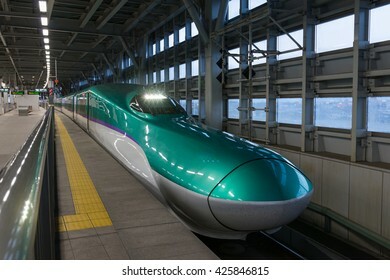 H5 Series enter service in March 26,2016 for Hokkaido Shinkansen line. NAGASAKI,JAPAN - MAY 30,2014 : The peace statue in the Nagasaki peace park. 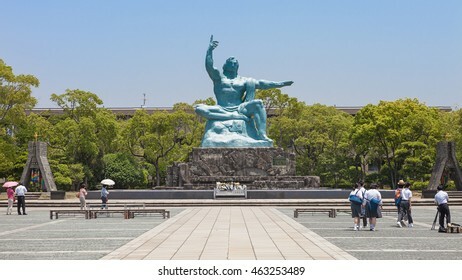 This bronze statue is 9.7 meters high, sitting on a 3.9 meter base, and weighs some 30 tons. Kakunodate city,Akita,Japan - April 27,2014 : Cherry blossoms or Sakura in Samurai district. 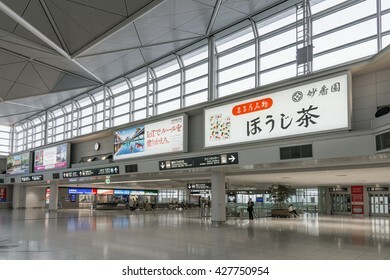 AICHI,JAPAN-April 7,2016 : The access plaza of Chubu centrair international airport ( Central Japan international airport ). 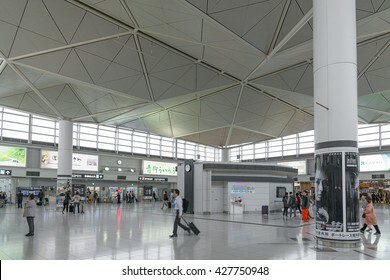 This facility serves to link public transport with the passenger terminal. 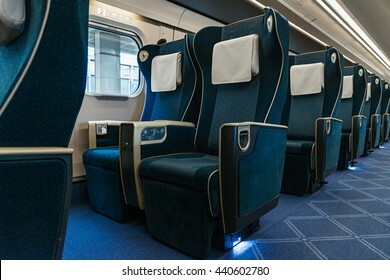 TOKYO-APRIL 7,2016: Green seats of The N700A Series bullet (High-speed or Shinkansen) train. 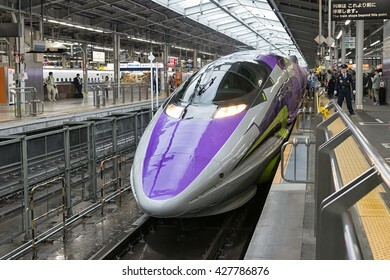 This Shinkansen train services as "Nozomi(Hope)" for Tokaido and Sanyo Shinkansen (Tokyo - Hakata route). TOKYO-APRIL 15,2016:E4 Series bullet(High-speed) train. 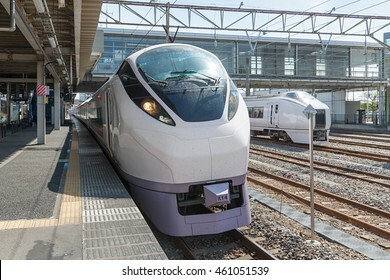 E4 is the last Double-Decker high-speed train type in Japan. 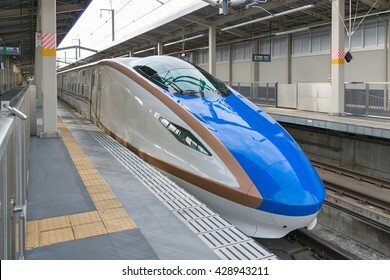 It services as MAX Toki or Tanigawa, operated by JR East on Joetsu Shinkansen line. YAMAGATA,JAPAN - APRIL 14,2016:Yamagataken gokoku shrine and full bloom Cherry-blossom(Sakura). This shrine was founded in 1869. 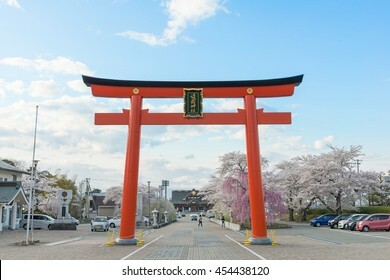 Around 130000 people come to visit this shrine on January 1 every year. 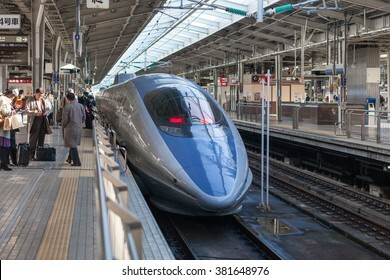 TOKYO - FEB 5: the 700 Series bullet train at Tokyo station on Feb 5 , 2013 in Tokyo. 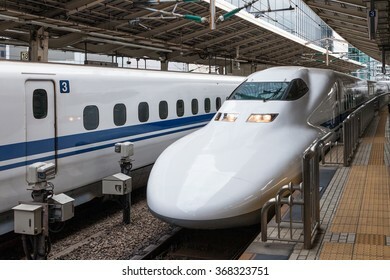 700 Series service as "Hikari (Light)" for Tokaido Shinkansen line (Tokyo - Shin Osaka route). 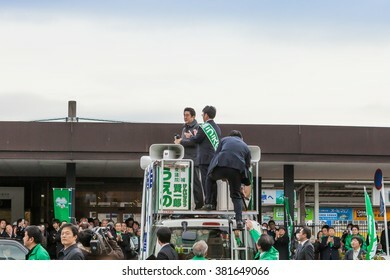 SHIGA , JAPAN - DECEMBER 5: Japanese Prime Minister Shinzo Abe during his canvassing on December 5 , 2012 in Shiga, Japan. 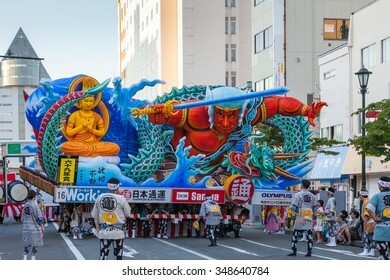 Parade of the Nebuta float and the crew in Aomori Nebuta Matsuri, Japanese summer festival at Aomori city, Japan on August 5, 2015. 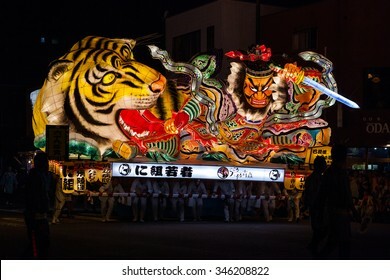 Illuminated Nebuta float parade through the night in Aomori Nebuta Matsuri, Japanese summer festival at Aomori city, Japan on August 5, 2015. YUFUIN,JAPAN - MAY 29: Tourist train called "Yufuin no mori(Forest of Yufuin city)" at Yufuin station on May 29 , 2014 in Yufuin city, Japan. 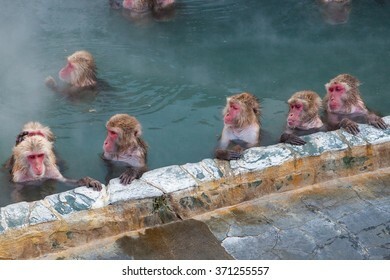 Yufuin no mori is the most popular tourist train in Japan. 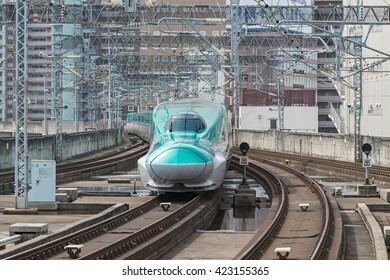 TOKYO - APRIL 2: Top view of the E7 Series bullet train on April 2 , 2015 in Tokyo. 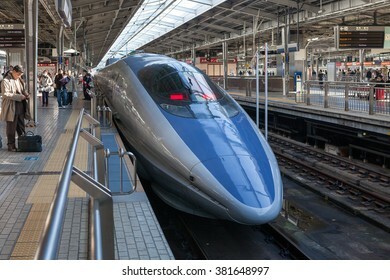 E7 Series bullet train service as "Kagayaki(Shine)" for Hokuriku Shinkansen line (Tokyo - Kanazawa route). 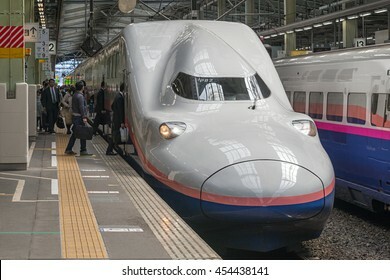 OSAKA, JAPAN - DECEMBER 4: the 500 Series bullet train at Shin Osaka station on December 4,2012 in Osaka, Japan. 500 Series service as "Kodama(Echo)" for Sanyo Shinkansen line (Osaka - Hakata route). IBARAKI,JAPAN - APRIL 20,2016 : The limited express train "Hitachi" at Katsuta station. 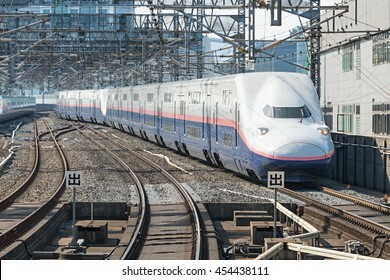 This train use E657 Series train operated by JR East in Joban line (Shinagawa-Iwaki route). 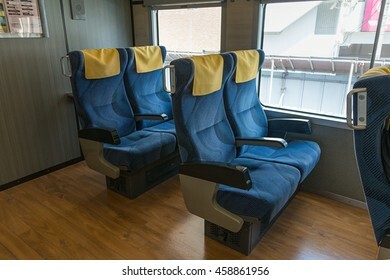 NIIGATA,JAPAN - APRIL 15,2016 : The seats of sightseeing train "Kirakira (Glitter) Uetsu". 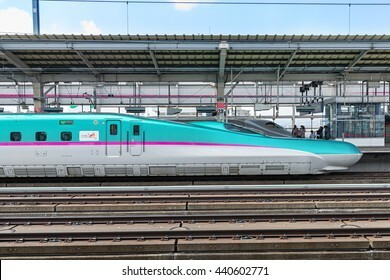 This is the most colorful train in the entire JR East rolling stock, This train run between Niigata - Sakata. HOKKAIDO , JAPAN - APRIL 19,2016 : Ekiben (railway boxed meals) in convenience store at Shin-Hakodate-Hokuto station. 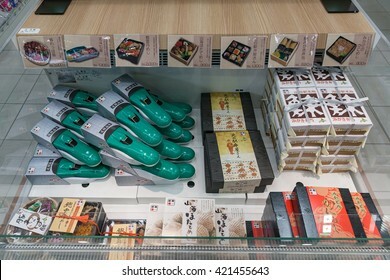 the Ekiben in H5 Series Shinkansen shape box is very popular. 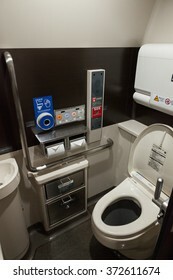 ISHIKAWA , JAPAN - APRIL 6 : high-tech toilets in E7 Series bullet train on April 6 , 2015 in Ishikawa, Japan. This toilets provide users a wide variety of functions. BEPPU,JAPAN - MAY 29: Tourist train called "Yufuin no mori(Forest of Yufuin city)" at Beppu station on MAY 29 2014 in Beppu city, Japan. 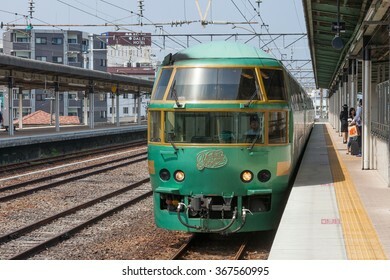 It is the most popular tourist train in Japan. 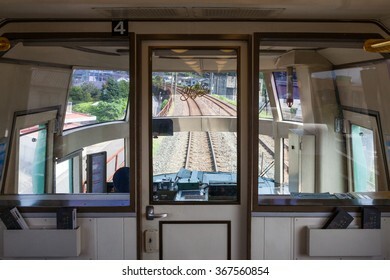 BEPPU,JAPAN - MAY 29: Driver cabin of tourist train "Yufuin no mori (Forest of Yufuin city)" at Beppu station on May 29 , 2014 in Beppu city, Japan. 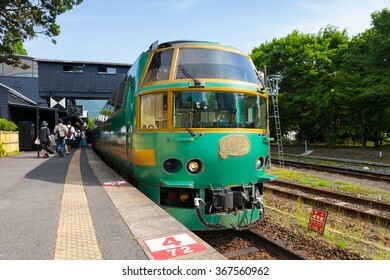 It is the most popular tourist train in Japan. BEPPU,JAPAN - MAY 29: Tourist train called "Yufuin no mori(Forest of Yufuin city)" at Beppu station on May 29 , 2014 in Beppu city, Japan. 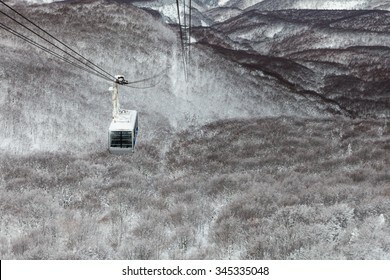 Yufuin no mori is the most popular tourist train in Japan. 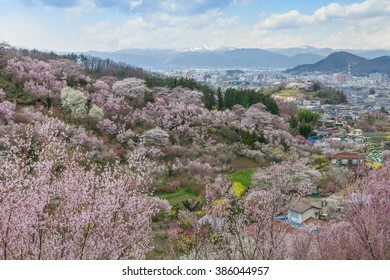 Cherry-blossom(Sakura) trees and Myoko Mountain in the distance. 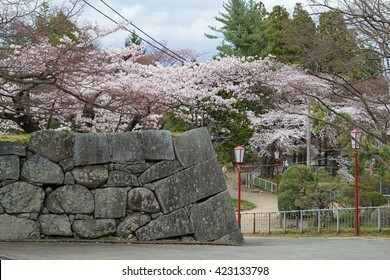 This spot is a very famous and popular Cherry-blossom(Sakura) viewing spot in Niigata. 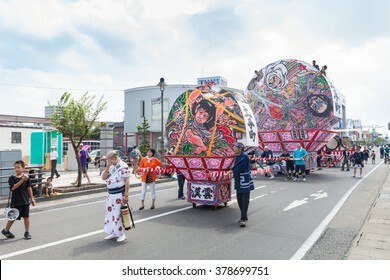 HIROSAKI,JAPAN - AUGUST 7:Hirosaki Neputa (Fan-shaped) float parade on August 7 , 2015 in Hirosaki city, Aomori, Japan. 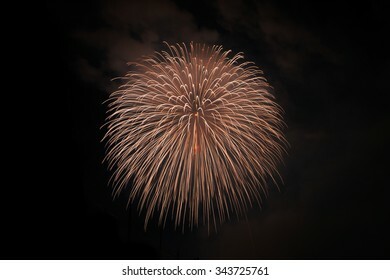 Hirosaki Neputa Matsuri is summer festival, held every year from August 1 to 7. 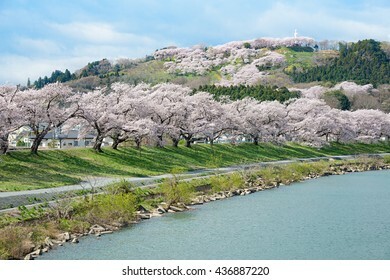 The full bloom Cherry blossom (Sakura) trees along the bank of Shiroishigawa river in Miyagi, Japan. 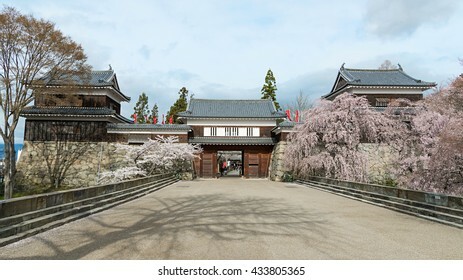 This place called Hitome Senbon Sakura (meaning one thousand Cherry blossom trees in one glance). 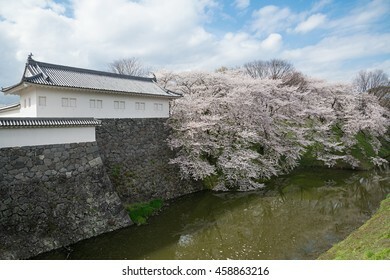 Full bloom Cherry-blossom trees along the moat at Ueda park. 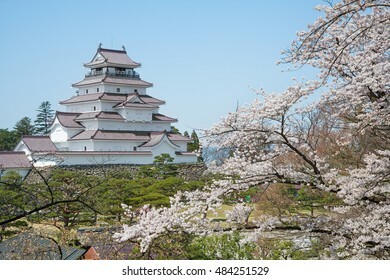 Ueda park is a very famous and popular Cherry-blossom (Sakura) viewing spot in Nagano prefecture, Japan. 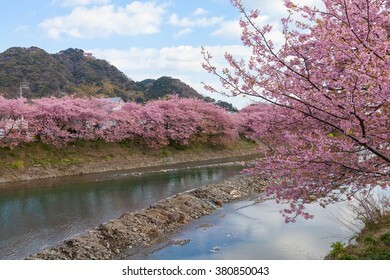 The Cherry blossom (Sakura) trees along the bank of Shiroishigawa river in Miyagi, Japan. 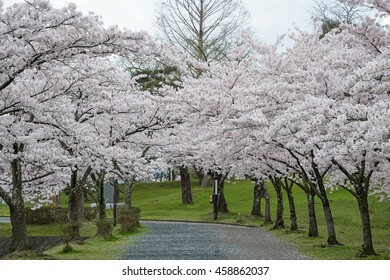 This place called Hitome Senbon Sakura (meaning one thousand Cherry blossom trees in one glance). 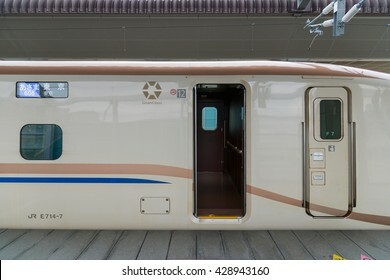 NAGANO,JAPAN-APRIL 8,2016:E7 Series bullet (High-speed or Shinkansen) train's Gran class door. 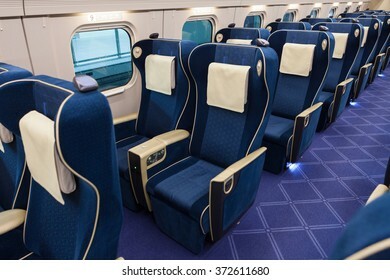 Gran class is the most luxury seat in Shinkansen. 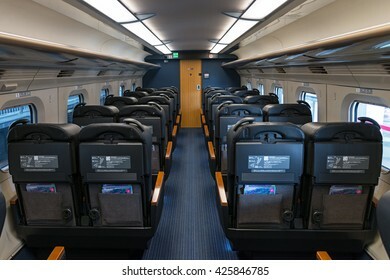 Only 4 trains (E5,H5,E7,W7 Series) have Gran class car. 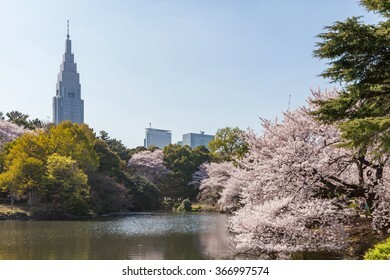 TOKYO - APRIL 2: The pond in Shinjuku Gyoen national garden with high-rise building on April 2 , 2015 in Tokyo. 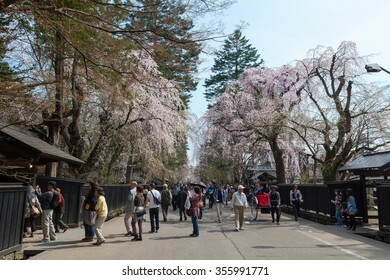 This park is a very famous and popular Cherry-blossom(Sakura) viewing spot in Tokyo. TOKYO-April 19,2016:Top view of the E5 Series bullet (High-speed or Shinkansen) train. 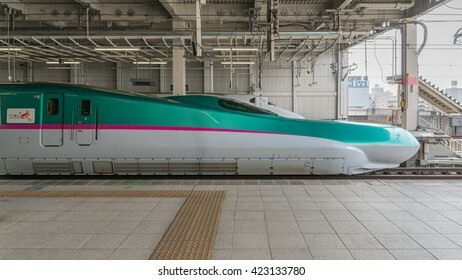 This train services as "Hayabusa / Hayate" operated by JR East/JR Hokkaido for Tohoku/Hokkaido Shinkansen lines. 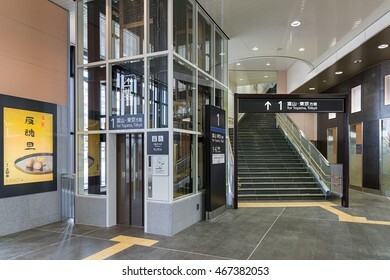 TOYAMA,JAPAN-APRIL 9,2016: Elevator and stair in Shin Takaoka station. This station operated by JR West for Hokuriku Shinkansen (High speed train) line (Tokyo - Kanazawa route) opened in March 2015. OITA,JAPAN - MAY 29,2014 : The local train "Y-DC125" at Yufuin station. 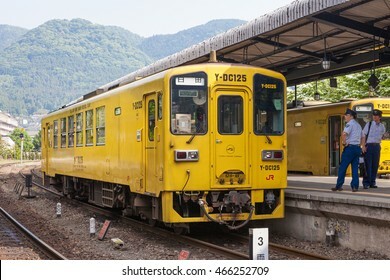 Y-DC125 (Yellow one man diesel car) use KiHa 125 train, operated by JR Kyushu or Kyushu railway company. 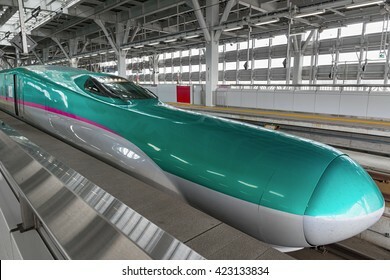 HOKKAIDO,JAPAN-APRIL 19,2016: The green E5 Series bullet(High-speed) train in Shin-Hakodate-Hokuto station.It service as "Hayabusa(Falcon) or Hayate" for Tohoku/Hokkaido Shinkansen lines.